Maybe you’ll be surprised to know that one of the most popular accessories used by filmmakers with single-handed gimbals are monopods. Yes, that’s right! For those unfamiliar, you can easily attach a monopod to your own Ronin-S by screwing in the device to either the 1/4” 20 or 3/8” screw hole located on the bottom of the gimbal grip handle. That way, with the added height, you’ll be able to perform camera movements that would otherwise only be possible with the use of expensive and bulky camera jibs/cranes. Filmmaker Felipe Olvera has combined a Ronin-S and monopod with the intention of producing some sweet shots with this simple, yet super effective camera setup and here’s the final result. The first composition covered in the video is a traditional camera jib establishing shot. As seen in numerous television shows and movies, this type of shot has the camera start at a high position and then slowly moving downwards. This movement helps establish the location of the scene, allowing the audience to get acquainted with the surroundings. You can take this technique up a notch by having the camera follow the actor after the movement from high to low has been performed. 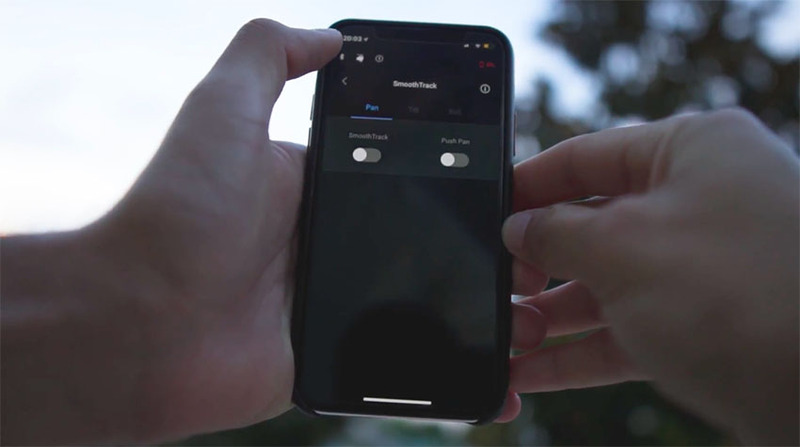 If you want to try and make your own jib shots using the Ronin-S, you’ll need to disable the SmoothTrack feature for the Pan, Roll, and Tilt axes inside of the DJI’s smartphone app beforehand. This additional step is required to ensure that the motors of the gimbal won’t conflict with your intended camera moves. A more daring variation of the latter setup would be a crane shot of a moving car. In this scenario, Olvera is seated in a moving car ahead of the Mustang he’s shooting. 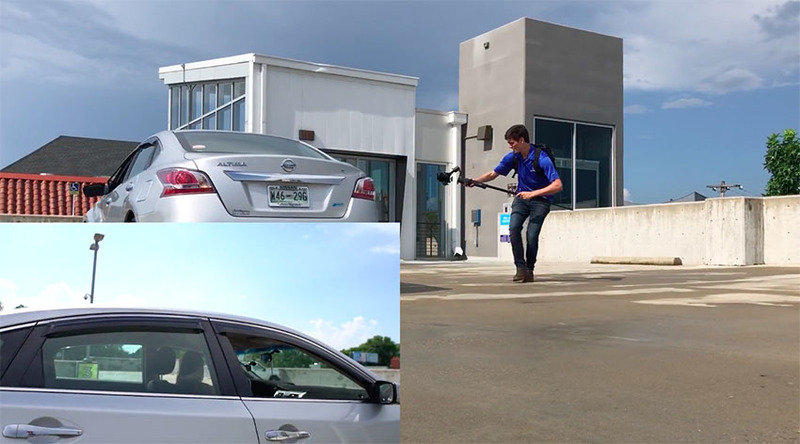 He then has the gimbal hanging off the back of his vehicle, gently raising and lowering the gimbal-monopod setup as needed. Another unique shot attained by the gimbal-monopod configuration is dubbed by Olvera as the Inception Shot, wherein the gimbal is free to roll as he moves with the subject. To achieve this camera movement, go into your companion app settings and set the gimbal to Flashpoint Mode. Next, turn off the Pan and Tilt motors, making sure to keep the Roll Motor enabled. When controlling the roll of your gimbal, you could also try using the smartphone app controls rather than the gimbal joystick for more precise control over the movement. The last shot shown in the video happens to be the most complicated. In this one, Olvera follows an actor outside of a building. The camera then comes behind the subject while entering the interior of the car. The actress then starts the vehicle and backs up from the parking space with the camera still inside. 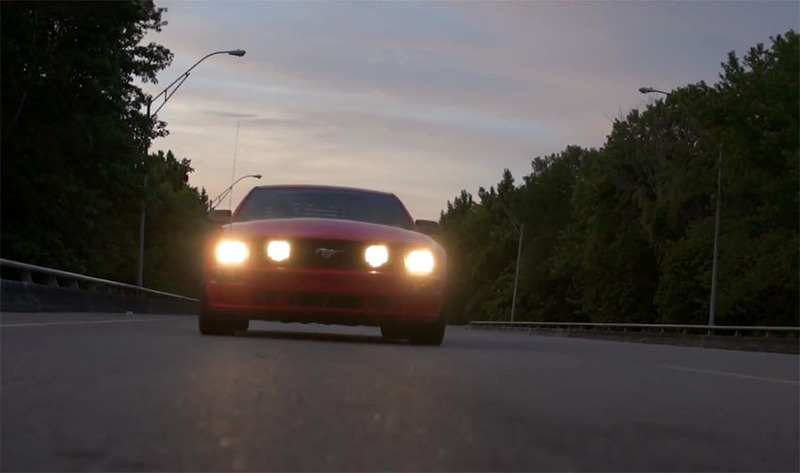 Lastly, just as the car is about to pull away, the camera exits as the vehicle drives ahead. The manner in which this shot was attained is quite straightforward. After the actress had gotten into the car, Olvera handed the gimbal to a camera operator hiding in the passenger seat of the vehicle. Just before the talent drove off, Olvera took back control of the gimbal and removed the camera from the car. With the combination of a gimbal and monopod, you can perform complicated camera moves and obtain shots in one take with some pretty exciting results. Moreover, this configuration is both lighter and cheaper compared to professional, bulky equipment. Last but not least, this setup essentially saves both time and back pain from having to lug around heavy camera gear and certainly can help you add more production value to any of your projects with ease.